In the digital news era, presidential candidates and their campaigns have a greater ability to serve as direct sources of news and information for the public. Pew Research Center has studied this evolution for the last five presidential cycles and finds that this year, the candidates’ social media posts outpace their websites and emails as sources of news. Roughly a quarter of U.S. adults (24%) turn to social media posts from either the Hillary Clinton or Donald Trump campaigns as a way of keeping up with the election, according to a new Pew Research Center survey conducted June 7 to July 5, 2016. This exceeds the portions that rely on the candidates’ campaign websites (10%) or their emails (9%). Overall, three-in-ten Americans get election news from at least one of these three online sources for news about the election. What’s more, most of those who rely on the candidates’ websites and emails for news also turn to candidates’ social media posts for information, whether on Twitter, Facebook or some other platform. About two-thirds of those who get news from either candidate’s website (63%) and about the same portion who turn to candidate emails (68%) also turn to a candidate’s social media posts. 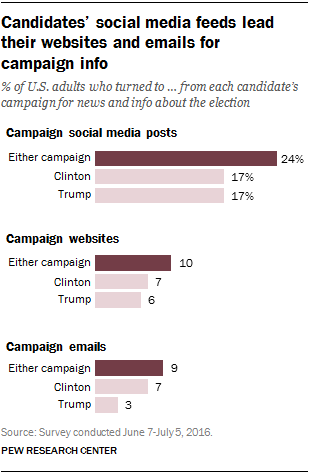 Individually, the Clinton and Trump campaigns have about an equal reach online: Roughly the same portion of Americans turn to each campaign’s social media feeds (17% each) and campaign websites (7% for Clinton and 6% for Trump). A somewhat greater portion turn to emails from the Clinton campaign (7%) than the Trump campaign (3%), but the figures are quite low for both. While supporters of each candidate are more likely to turn to their preferred candidate’s social media, the data also reveal some political cross-pollination. 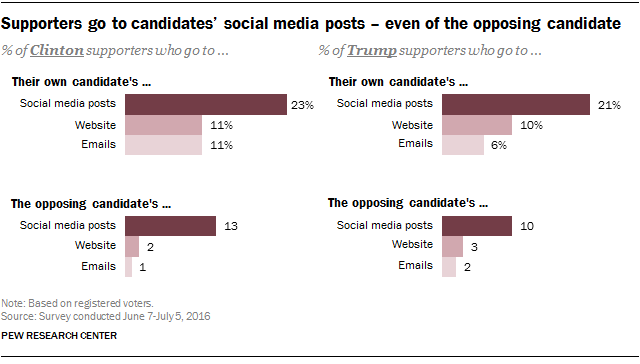 Among registered voters, one-in-ten Trump supporters go to Clinton’s social media posts, which is similar to the 13% of Clinton supporters who turn to Trump’s. What’s more, the rate at which these registered voters turn to the opposing candidate’s social media feed is about on par with the rate at which they turn to their preferred candidate’s website or emails: About one-in-ten Clinton supporters (11%) turn to her website and the same portion turn to her emails, where as 10% of Trump’s supporters turn to his website and 6% to his emails. Very few turn to the websites and emails of the opposing candidate. 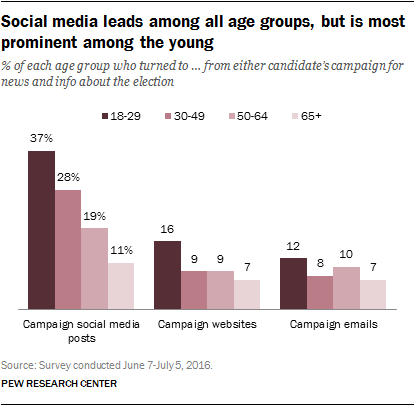 Younger adults stand out as an audience for the campaigns’ social media activity. While all age groups rely on social media communications more than email or websites, young adults do so in the largest numbers. Nearly four-in-ten (37%) of those ages 18 to 29 turn to candidates’ social media accounts, compared with 28% of those ages 30 to 49, 19% of those ages 50 to 64, and 11% of those 65+. Younger adults also are more likely to turn to candidate websites, although the difference is not as prominent.